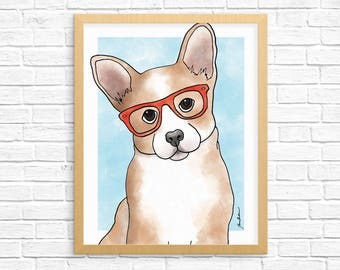 Animal wall art, art prints and stationery. Announcement Hi fellow animal lovers! I am an illustrator and Graphic Designer with an Insta feed full of adorable animals. 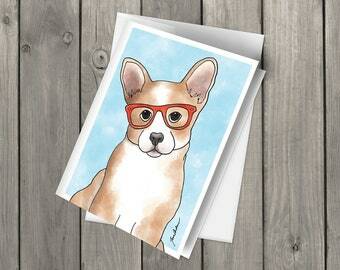 I love creating pet portraits that display their true personalities and characters. Thanks for visiting all my adorable animals. Hi fellow animal lovers! I am an illustrator and Graphic Designer with an Insta feed full of adorable animals. I love creating pet portraits that display their true personalities and characters. Super cute card, quick shipping, and a couple of extras - thanks! Cute cat pin NEW in the shop! Grab one now. Take this cuties with you everywhere on your journal. 3 inch vinyl stickers available in multiple styles. 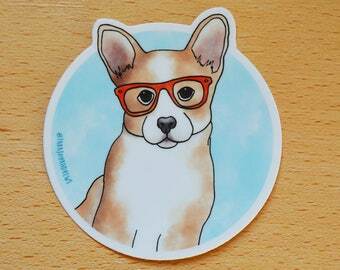 Add cuteness to your journals and sketchbooks with adorable laptop stickers. My home studio where all my creative ideas come to life. A few of my creations printed and framed on display in my studio. My many pencils, pens and other writing instruments. My two cats are never far away and often inspect what I am working on. Hi, I’m Tara, an Illustrator and Graphic Designer based in Halifax, Nova Scotia, Canada that still sends letters to friends and family via snail mail with pen, paper, and stamps. I fell in love with writing and all things creative when I was young. I love putting words or doodles on a blank page. Today we are more likely to text, tweet or Facebook someone, but I still love writing letters, folding the paper and tucking it into envelopes. There is nothing like reading someone’s own handwriting. I love illustrating pets with a lot of character and personality. I add glasses and other accessories to help bring more of that personality out. I enjoy making work and art that makes people smile. I'm an Illustrator and Graphic Designer from Halifax, Nova Scotia, Canada. I love bringing ideas to life by giving each piece it's own character and personality. Welcome to my creative space. I can offer refunds within two months after purchase date if the item is returned in original packaging and not damaged. Once the item arrives safely and in my hands I will refund your PayPal account. I ship using Canada Post / USPS but can send packages by another carrier if required. Contact me before checking out for more details. Please note that letter mail shipped from Canada does not include tracking numbers. If you prefer shipping with a tracking number please contact me before checking out. Buyers are responsible for any duties or import fees for packages sent to them.